Please note: this section is intended to be no more than a suggestion for some interested person to develop. Entries are haphazard at best. It is intended that this page be no more than an index to individual pages for each entry, but for the time being such entries as do exist are mostly found only on this list. Akka [cp. Sk. arka] N. of a plant: Calotropis Gigantea, swallow-wort M I.429 (*assa jiya bowstrings made from that plant). Campaka Michelia Champaka. 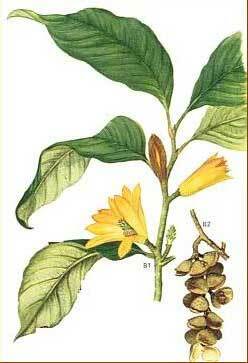 A large tree, commonly grown in temples, with fragrant, light yellow flowers. A type of jasmine. bark: ferbifuge, stimulant, expectorant, astringent; dried root and bark: purgative, in form of infusion useful emmenegogue; flowers and fruts: considered stimulant, antiseptic; mixed with sesame oil forms an external application in vertigo; oil from flowers: useful application in cephalalgia, opthalmia and gout; seeds and fruit: used for healing cracks in feet; essential oil 0.11%; habitat: wild in the eastern sub-Himalayan tract and lower hills up to 3,000 ft., Assam, W. Ghats and S. India; much cultivated in various parts of India. Dalbergia Sisu or the Asoka tree SN 5.56.31, AN 1.136, DN 2. 316, MilP. 413. Khadira [Sk. khadira; Gr. ki/ssaros, ivy; Lat. hedera, ivy] the tree Acacia catechu, in cpds. Tala [Sk. tala, cp. Gr. ta_lis and thleqa/w (be green, sprout up) Lat. talea shoot, sprout] 1. the palmyra tree (fan palm), Borassus flabelliformis; freq. in comparisons and similes M I.187; J I.202 (-vana), 273 (-matta as tall as a palm): VvA 162; PvA 100 (chinnamulo viya talo). - 2. a strip, stripe, streak J V.372 (=raji). Usira A scented root much used for perfumes. Dhp. 337 AN 3.69.